Below is a brief description of the contents of some of our newsletters. We sometimes include one or more of our articles on this web site a few months after they appear in the Istokpoga Newswire. We hope you will find these samples interesting enough to want to see all of our other articles and news. If you are interested in getting all of our news, in a timely manner, then you must join our association. Please see our Membership Page for details. If you become a member you will have access to our full newsletter by mail and/or via the Members Only section of this website. September 2007 This issue features an article by Dr. Paul Gray, Ph.D., titled "Wading Bird Nesting on Lake Istokpoga. There is also a very informative article, "June 2007 Hydrilla Management on Lake Istokpoga" by Erica Van Horn, Regional Biologist for DEP. FOI President Bert Galloway also updates us on "What's Happening on Istokpoga". April 2007 Leading off this issue is " Hydrilla Management Plan for Lake Istokpoga" by Erica Van Horn, Regional Biologist for DEP. There are also many articles updating everyone about the lake association, including the election of officers. "What's Happening on Istokpoga" is also in this issue. February 2007 The lead article is about the invasive plants that are found in Florida Lakes. 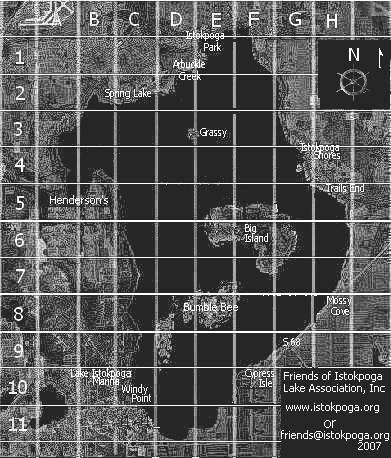 There is a summary of some of the associations activities; a pull-out grid map to help those not too familiar with Lake Istokpoga; an introduction to our newest FWC Biologist, Steve Gornak; and another edition of our President's "What's Happening on Lake Istokpoga. October 2006 The lead article is about alligators on Lake Istokpoga. There is also an articles about armored catfish, our next meeting, Florida LakeWatch, and "What's Happening". May 2006 we had an update on the Ospreys of Lake Istokpoga by Mike McMillian, The announcement of the FOI Message Group, an explanation of the purpose of our lake association, and a change in the board of directors. February 2006, a six page edition, feature article was "Navigating the Responsibility Maze" by Clell Ford, Highlands County Lakes Manager. An article outlining the revegetation of the drawdown islands, a residential canal update, announcement of a March Bass Tournament, information on the Alligator Hotline, and an article about the on-going Istokpoga Watershed phosphorus problem. November 2005 featured an article by Beacham Furse, Aquatic Plant Management on Lake Istokpoga. Also were articles on Blind Mosquitoes, an introduction to Kristin Veasey, and information on the November membership meeting. The June 2005 issue has articles on the halting of the hydrilla treatment, a plea for help from our members about all the concerns for the health of the lake and how they can help, and an article thanking the Highlands Airboat Club for their work on Lake Istokpoga. Our November 2004 issue gives a summary of the many things going on that concern the lake. This includes an article about the project the SFWMD is funding to study cleaning out the residential canals on Lake Istokpoga. The Highlight of the May 2004 issue is an article titled "Are the Lake Okeechobee Projects Going to Help Lake Istokpoga". There is also an article about the hydrilla situation on the lake, and a summary of the Florida Wildlife Commission law violations. This is our biggest newsletter yet. Royce Unit of Lake Wales Ridge Wildlife and Environmental Area. The September 2003 contains a number of important articles about Lake Istokpoga and issues effecting it, including articles by Clell Ford, Highlands County Lakes Manager; Bill Dwinell, President of Friends of Istokpoga; Missie Barletto, SFWMD; Dr. Frederick Bell and Dr Mark A. Bonn, Florida State University; and Robert Nelson, The Nature Conservancy. The April 2003 issue features an article, by Dr Mark Allen, Managing Fish Populations with Size Limits, gives insight into the management of our lake. The January 2003 issue featured an article about Phosphorus and how the Department of Environmental Protection isn't doing what it should to protect our lake. This issue also has an article on fish hoarding and how you can report this type of activity. The October 2002 issue features articles on the the Mercury levels in Lake Istokpoga, an update on the Windy Point Park Project, information on the Royce Unit of the Lake Wales Ridge Wildlife and Environmental Area, and the Regulation Schedule Project for Lake Istokpoga. The April 2002 issue feature article was about the Silver Harbor Ranch, which was purchased by the State of Florida. The article will also cover some of the plans the FFWCC has for the ranch. The January 2002 issue feature article was written by Dr. Paul Gray, National Audubon Society. His article, "The Present Status of Lake Istokpoga's Water Birds" discusses the status and concerns with the water birds that frequent Lake Istokpoga. The October 2001 issue features an article, "Phosphorus Problem in Lake Istokpoga? ", which outlines the current phosphorus levels in the lake and is a call for action to track down the source of this phosphorus. The July 2001 issue features a Review of the drawdown. Starting back in March 1998 and covering the plans, issues, difficulties and implementation of the lake restoration. This issue was mailed the last week of July. Our March 2001 issue features an article jointly authored by Dr. Paul Gray and Bill Dwinell titled "Can Lake Istokpoga end up like Lake Okeechobee". This article warns us of increasing levels of phosphorus in Lake Istokpoga. This issue also included charts and maps of the Lake Restoration work and maps showing the hydrilla treatment areas and testing sites. In January 2001 there were articles about the drawdown, about the loss of water in the lake and an article about our success in getting the G-85 structure repaired. The October 2000 issue features an article about G-85 and concerns it might not last until a new structure can be built. It also contains an article about the upcoming hydrilla treatment planned for Lake Istokpoga, By Dave Demmi, DEP, and an article by Jim Wilkins about Weed Control. The September 2000 issue contains an article by Bill Dwinell on Canal Maintenance. This article spells out what is needed to obtain a permit from DEP to clean up your canal. It also has a column by Clell Ford about Evaporation. being the main cause of the low lake levels we are currently experiencing. Our May 2000 issue features an article by Bill Dwinell about the South Florida Water Management Districts 20 year Water Supply Plan for the Kissimmee Basin, which includes Lake Istokpoga. It also has an article regarding a tour of the Alligator Lake drawdown underway near St. Cloud, Florida. Our February 2000 issue features a guest article by Mike McMillian on Ospreys. Mike is an expert on Ospreys around Lake Istokpoga. Mike's article is very informative about the World's Largest Population of Ospreys - Which are on Lake Istokpoga. Our January 2000 issue featured articles about what the Friends of Istokpoga Lake Association has been doing for the past year. Ó 1998 - 2011 Friends of Istokpoga Lake Association, Inc.